It’s been a long time coming, and now it looks like the age of the flexible OLED screen smartphone is just about here. In 2011 two different manufacturers came out with concepts for flexible, bendable phones that are unlike anything we’ve seen until now. Both of the concepts are totally amazing, but neither is quite ready for store shelves just yet. Samsung’s Galaxy Skin is sleek, bendy, ultra-thin and virtually indestructible. The AMOLED screen can be manipulated into tons of different configurations for talking, time-keeping, listening to music, watching movies and probably a hundred other things. 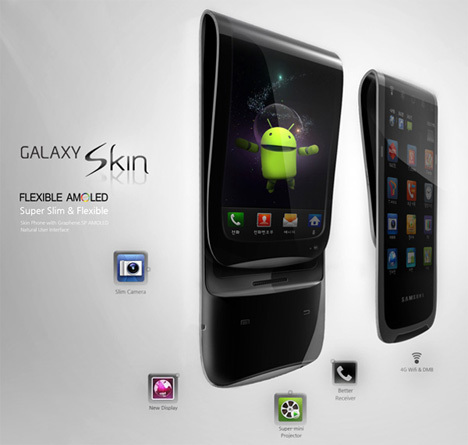 The Galaxy Skin concept is the product of designer Keyon You. Although Samsung showed off a very cool physical mockup of the phone at CES 2011 there’s no release date for it yet. The other flexible phone design getting a lot of attention right now is Nokia’s HumanForm. It does not – despite its name – have the form of a human. 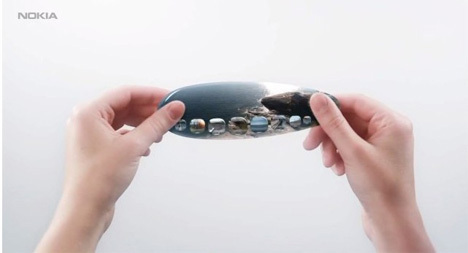 It’s actually a teardrop-shaped thing with a touch screen the size of the entire phone. The phone design itself is just so-so, but the kinetic interface shown in the video below is completely bananas. Twisting, folding, shaking, and otherwise manipulating the phone itself – rather than just some abstract buttons on a screen – sounds like a pretty good way to get out the frustrations of the day. Will we ever get to play with a phone like this in everyday life? Probably not in the next few years, but the time of the AMOLED phones is coming – and it’s going to be a bendy ride.